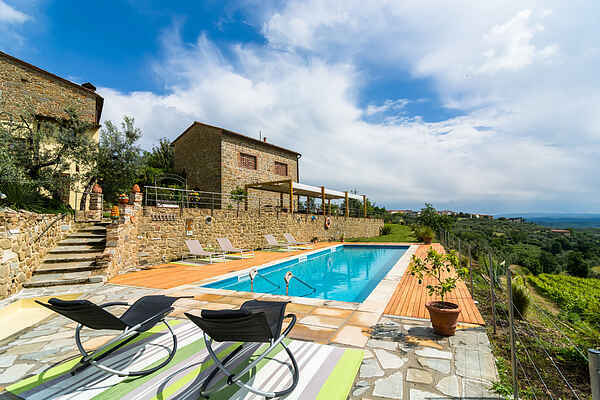 In the birthplace of Leonardo da Vinci, located a few kilometers from Florence, you will find this typical Tuscan stone farmhouse, whose origins date back to 1500. Restored by the owners with great care and maintaining the authenticity of the place, the main building is now transformed into a lovely farm devided into several apartments with all types of architectural details typical of the ancient buildings in this rural area. Today the main building and barn, both of historical interest, enjoy the dominant view of the valley and the neighboring terraces. About 80,000 square meters of agricultural land cultivated with olive trees surround the house, with meadows and forested areas concentrated in the lower areas.